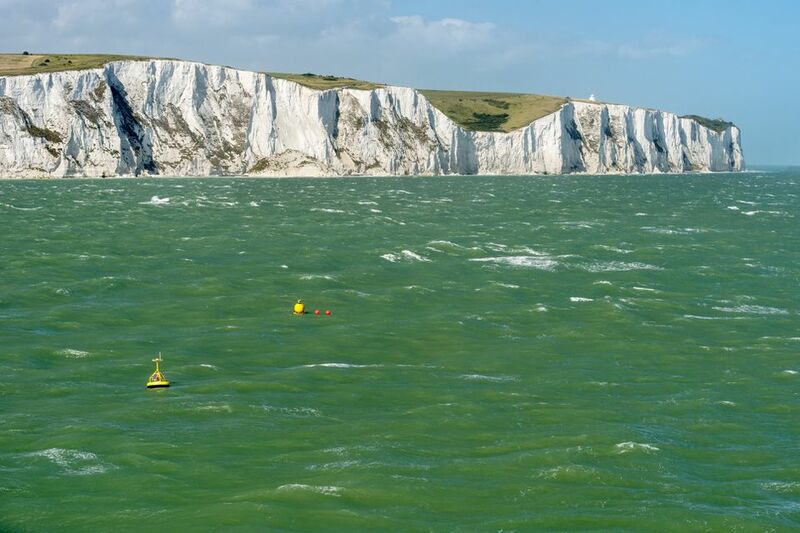 The English Channel, that finger of the Atlantic Ocean that separates Great Britain from Northern France, is less than 19 nautical miles wide between Dover and Calais - what the locals call the fast channel crossing. If you're traveling from Continental Europe to the UK, think twice before you buy a plane ticket. Some cross-channel options by tunnel or ferry could be faster - and cheaper. Travelers have a good choice of options for crossing La Manche, as it's known in France. Depending upon the departure point, taking a high-speed train or a ferry can also be a more comfortable, more eco-friendly and more convenient choice than flying to the UK from France, Belgium, Northern Spain and, since 2018, the Netherlands as well. Eurostar the high-speed rail link travels through the tunnel to London St Pancras Station or Ashford, Kent, from Amsterdam, Brussels, Paris, Lille, Disneyland Paris, the ski resorts of the French Alps (in season) and as far south as Marseille. Departures are frequent, the trip from Paris takes about two hours and 15 minutes and, if you book in advance, there are very good deals on the Eurostar website. Seats are spacious and comfortable and, depending upon the fare you choose, you can have a meal served at your seat, The best part of Eurostar is that you travel city center to city center: Get on the train in the center of Paris and a few hours later you are in Central London. That means you don't have to worry about expensive taxi fares to your city destination or navigating confusing public transportation when you are tired from travel and lugging baggage. If you compare the time and cost of traveling between airports and city center hotels at both ends of the journey, the benefits quickly become apparent. Eurotunnel Le Shuttle is the car shuttle from Coquelles, near Calais, to Folkestone in Kent. Le Shuttle, often referred to as Le Chunnel, also carries bicycles and coaches. There are four departures per hour in peak times, bookable in two-hour windows. You drive your own car on to the train in France, spend 35 minutes relaxing while it races under the Channel and then drive off in England. Save money by booking well in advance because there are great deals to be had. If you are traveling with a pet, Le Shuttle car transport makes the most sense because your pet can travel with you in your car and, as long as your pet has a pet passport, the formalities are minimal. It's also a good choice if you are traveling with a large family or group of friends because the price is quoted per car with up to nine passengers, rather than per passenger. The terminals for Le Shuttle connect you to major motorways at both ends of the journey and the junctions are engineers to ensure that you end up driving on the correct side of the road for the country you are in. When the Channel Tunnel was completed, everyone thought it would be the end of ferry crossings. It's true that it shook up the industry and ferry services from the UK to Boulogne in France, once a popular destination came to an end. But ferries are still the most economical crossing choice for cyclists, pedestrians, people with oversized vehicles, people traveling with pets, and those who just like a short voyage as a kind of punctuation between countries. Brittany Ferries - This company has the most crossings to France and Spain and has an interesting story of its own. It was launched by a group of Bretagne farmers in 1973, simultaneously with Britain's entry into the (then) Common Market. They wanted to take advantage of the new open trade with Britain to sell their cauliflowers and artichokes. Brittany felt isolated as it was far from the other channel ports. When the farmers were unable to tempt a ferry company to transport their produce to markets in Plymouth, they bought their own small freighter to do it themselves. Condor Ferries, from St. Malo to Poole and Cherbourg to Portsmouth, cross with connections on the Channel Islands of Jersey and Guernsey. DFDS Seaways, the ferry division of Northern Europe's largest shipping and logistics companies, operates ferries from Dunkirk and Calais to Dover (the shortest crossing), Dieppe in Normandy to Newhaven, Kent and from Newcastle to Amsterdam. Their ferries to France are recently reconditioned or rebuilt, clean and very comfortable. The crossings we've recently sampled were well organized, with good catering, comfortable lounges and big, clean windows for enjoying the views, even in poor weather. DFDS Seaways ferries are our recommended choice for the short crossing if you are heading anywhere in Normandy or Pas de Calais or driving on to Paris and the South of France. P&O Ferries operate frequent ferry services from Calais to Dover as well as longer, North Sea crossings from Zeebrugge in Belgium or Rotterdam in the Netherlands to Hull on England's northeast coast. Cabins are available for the longer crossings from Belgium and The Netherlands. These longer crossings take about 12 hours but, if you book a cabin you can substitute the crossing for a night's hotel accommodation.